Your smile says a lot about you. In fact, numerous studies have indicated people who have attractive smiles are often consider smarter, healthier, and more attractive. A 2011 employment study even indicated the appearance of your smile may influence whether or not you get a job. Unfortunately, many of the patients we see at Harrisonburg Family & Cosmetic Dentistry think a flawless smile is out of their reach. Our team is here to help you a create beautiful, healthy smile you’ll be proud to share. Not all cosmetic dentistry plans involve years undergoing complex treatments. Porcelain veneers are one of the most popular treatments we offer because they allow us to completely transform your smile in just two short appointments. If you want to learn more about porcelain veneers or your other cosmetic dentistry options available from our Harrisonburg dental team, call to schedule a cosmetic dentistry consultation today. Veneers are thin sheaths of dental grade porcelain. They are designed to fit over the front facing surfaces of teeth to correct and conceal any number of cosmetic flaws. From covering tooth staining to closing gaps in teeth, porcelain veneers can completely transform your smile. No cosmetic dentistry solution is right for every patient, but we may recommend porcelain veneers in a variety of situations. If you want to correct or conceal numerous smile flaws, but don’t can’t afford to invest the time in more advanced treatments, porcelain veneers may be the ideal solution. If you have deep set tooth stains that aren’t responsive to teeth whitening, numerous chips and cracks, or extensive dental wear, a porcelain veneer treatment plan can easily create a flawless smile. Additionally, porcelain veneers have been referred to as instant orthodontics because they can be used to create a perfectly aligned, evenly spaced smile without the hassle of advanced orthodontic treatments. 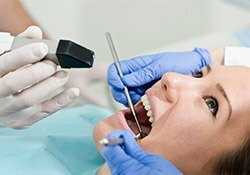 Porcelain veneers are placed over the course of two office visits. During the initial appointment, we will numb the area to be treated. Then, a small amount of surface enamel is removed. This allows the veneer to lay flat within the smile line. Next, an impression is taken of your prepared teeth. We’ll design your final veneer, and our design and the impression are sent to a lab where your veneer will be crafted. To protect your teeth and allow you to get used to the look and feel of your new smile, we’ll place a temporary veneer. When we receive your final restoration from our lab, you can return to exchange your temporary for the flawless, custom porcelain veneer. With proper care your porcelain veneers will remain flawless for ten or more years. Unlike other restoration materials, our high quality, dental grade porcelain is stain resistant. That means you can even enjoy coffee, red wine, and other darkly colored foods and drinks that may stain teeth without affecting your results. You may want to switch to a softer toothbrush or less abrasive toothpaste, but otherwise, you will not need to worry about making changes to your regular hygiene routine.